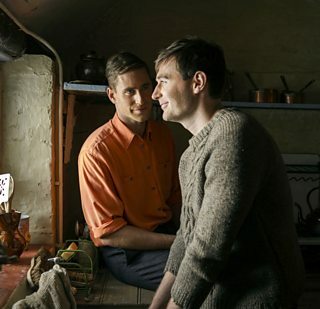 The drama Man in an Orange Shirt is part of the BBC’s Gay Britannia season which marks the 50th anniversary of The Sexual Offences Act 1967. How did you become involved in the season and why is this such an important anniversary? The drama has had a six year genesis. 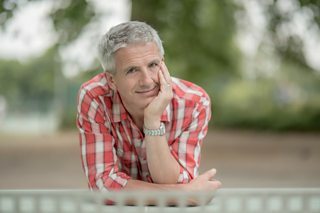 It was commissioned by Lucy Richer at the BBC who expressed a wish for a story that reflected “gay male experience in the 20th century” and for something with “the flavour of a Patrick Gale novel”. She ended up with me by the happy coincidence that I used to play bridge with Sue Swift at Kudos! The initial idea was that this would be a mainstream show to be aired in a prime time BBC One slot but it fits so beautifully into the Gay Britannia season that I was more than happy for it to glide across to BBC Two. These days so many viewers watch on BBC iPlayer that I’m fairly sure many of them, especially the younger ones, no longer think in terms of which channel a show is on. Inevitably, over a six year period, my ideas for the show evolved. Initially it was more markedly political and issue driven. I planned three episodes – a tragedy, a comedy and a problem play – linked only by the painting of the title and the cottage in which the various love stories play out. And I had the mad idea that each episode would use the same actors in different roles in a way that would highlight parallel situations. What we’ve ended up with is far more directly emotional in its approach – a pair of big, swoony love stories woven through with profoundly uncomfortable themes of shame and betrayal. I hope I’ve remained true to at least one of my original stated aims which was to deliver a drama that wasn’t celebratory but, rather, challenging to gay and straight viewers alike. You are known as a novelist and have written adaptations of some of your novels for screen. Was this the first original screenplay that you have written? Why did you decide to write an original story rather than adapting one of your novels? Were you given a brief or freedom to decide what story to tell? The brief was for an original story and Lucy Richer and the team from Kudos gave me a fantastic amount of imaginative freedom (at least until the time came to look at the script with budgetary constraints in mind – when we promptly lost the WW2 plane crash with which the show originally began!). I confess there were dark hours when I wondered whether it would not have been easier to tell the same story as a novel, but now that I’ve seen the beautiful finished article, I’m very glad I didn’t. How do you decide on your story? 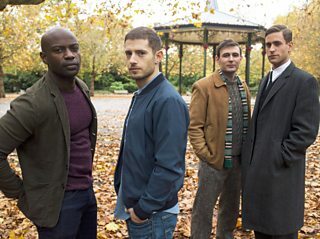 I knew that Lucy’s initial wish for a show with the flavour of a Patrick Gale novel meant that she specifically wanted a story in which gay men’s lives were enmeshed within those of their wider families. So I was never going to write within a gay bubble or about a gay ghetto – although I enjoyed giving glimpses of such worlds. Wanting to appeal to a wider audience meant that I was constantly asking myself what would keep a putative Daily Mail reading golf playing couple from Guildford, say, keep watching. That was always going to be emotional realism and ensuring a really compelling story arc for the show’s heterosexual heroine, Flora. Like a lot of women of my mother’s generation, Flora enters marriage a complete innocent and is obliged to work her way through a series of ever more wounding compromises in order to maintain a happy and respectable front. I hope a lot of straight viewers will be drawn in by that, wondering how she will cope. And I think a lot of younger straight viewers will find themselves wondering if they would have behaved differently. How involved were you in the production process of Man in an Orange Shirt? Did you have a say in the casting? Have you always written scripts alongside novels and short story writing? Funnily enough my first main output as a writer was terrible teenage plays – powered by my then burning desire to become an actor when I left school. Novels took over completely but at regular intervals some film company or other bought the rights to one of my novels and had me write a script. So, although none of those films saw the light of day (I have a full bottom drawer, should any producer be reading this) I effectively served a very useful apprenticeship as a screenwriter in the background while developing my career as a novelist. Can you compare the two disciplines of prose and screenwriting? What are some of the key challenges in moving between them? The most obvious difference is length. An hour’s script is barely 58 pages and each draft of that can take mere days to write. A four hundred page novel will usually take me two years or more to produce. The rewriting of a novel is far swifter, however, than the repeated tweaks and rewrites of a script. This is partly a condition of economics – there is so much money involved in bringing a script to the screen that far more people take an interest in the process of development and editing. Writing a novel feels very independent, by comparison, but also very lonely; I relish the sometimes pretty combative process of collaborating on the emerging script but I’ve also had to learn to develop a thicker skin and to be more aggressive in defending narrative decisions when my instinct tells me they’re the right ones. A novel never gets as cut and chopped back as a script does, and I’ll probably never stop mourning the scenes, characters and whole storylines which had to be chopped away. However I’m still in awe of the mastery with which director and editor can cut so much and deliver a final edit which is so recognisably the vision I had in my head. Do you have a preference and are there more stories you want to tell on the screen? There are pleasures in both. I relish the solitary obsessiveness of novel writing but I’ve really enjoyed the collaborativeness of screen work. And I think I’ve learnt writing lessons on Man in an Orange Shirt which I’m taking back to my novel writing and any future adaptations of my novels, but I also hope I’ll get another request to write something original for the screen. What do you hope viewers will take away from Man in an Orange Shirt? Just as with my novels, my main hope is that they will find themselves caring deeply about my characters. If viewers don’t care, I’ll have failed. And if they do care, that means they’ll also be thinking hard about the history and the psychology behind the storyline, which will be great. Do you have any advice you could share for other budding writers or that has been particularly useful to you? The best advice I’ve had as a screenwriter came very early on from the eminent producer, Brian Eastman, for whom I wrote a few episodes of a comedy series called Head Over Heels. He said you should try to tell your whole story without a word of dialogue first and then add the dialogue in almost as icing on the cake. Such good advice, which I follow to this day. It’s important to think in pictures, and dialogue – in scripts as in novels – is actually a terribly slow form of storytelling.